Sheikh Rashid bin Humaid Al Nuaimi, chairman of Ajman Municipality and Planning Department, at the Falconcity of Wonders stand. Leading property developers from across the world took part in the Middle East’s largest property showcase – Cityscape Global –which concluded last month (September 8 to 10) in Dubai, UAE. The 14th edition, inaugurated by Sheikh Maktoum bin Mohammed bin Rashid Al Maktoum, Deputy Ruler of Dubai, was held at Dubai World Trade Centre on significantly expanded exhibition space. 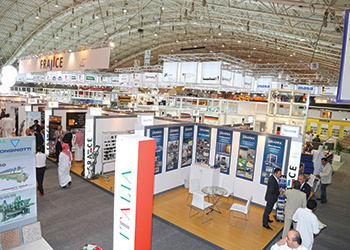 The event was extended by two additional exhibition halls – four more halls since the 2013 event – covering more than 40,000 sq m of exhibition space. Headline exhibitors that returned for 2015 included Emaar, Dubai Properties, Dubai World Central, Meydan, Meraas and Nakheel while first-time exhibitors included Kleindienst Group, Dubai Multi Commodities Centre (DMCC) and Al Barari. Emaar Properties, the global developer of iconic projects, presented The Opera District in Downtown Dubai, in addition to other lifestyle developments in Dubai and key international markets. Its showcase of Dubai projects included new launches such as The Address Residence Sky View, The Hills and Palma villas in Arabian Ranches. Nakheel unveiled The Palm Promenade, which it said will transform the entire trunk of Palm Jumeirah into a walkable beach, park, retail and café complex. The Palm Promenade will stretch 1.5 km along the island’s trunk, with new walkways and road crossings. Luxury real estate developer Damac Properties launched the world’s first Bugatti-styled villas that are set to come up in Dubai as well as an exclusive four-tower project Viridis at Akoya Oxygen, its iconic 55-million-sq-ft master development (see Real Estate feature). Sharjah Oasis Real Estate Development launched its most iconic project – Sharjah Waterfront City. Spread across 36 km of coastline with a total area of 60 million sq ft, the project provides a fully advanced residential, commercial, and tourism development project in the region, the developer said. Meydan City Corporation brought two of its major real estate developments to life at the expo. The star attraction on the 792-sq-m stand was Meydan One, a 3,671,000-sq-m leisure, residential and hospitality destination set to become a leading Dubai destination when the first phase opens in 2020. Progress on the Dubai Water Canal development, a joint venture project with the Roads and Transport Authority (RTA), Meydan City Corporation and Meraas, was also highlighted. The Canal, which runs 2.9 km connecting Business Bay to the Arabian Gulf, will include the development of the Crystal Lagoons in Safa Park as well as 8.1 km of waterfront. Al Hamra Real Estate Development launched Phase Two of the Dh1-billion ($272 million) Falcon Island development. Located in Ras Al Khaimah, the 2.2-million-sq-ft freehold island community comprises a collection of 150 luxurious five to eight-bedroom Canal, Beach and Park residences, complemented by private beach access, landscaped green spaces and waterfront views. Falconcity of Wonders, a leading property developer in Dubai, attracted a high number of potential investors during the three-day event. The more than 41-million-sq-ft project is famous for its reproduction of the seven wonders of the world. Diyar Al Muharraq, one of the leading urban developers in Bahrain, offered visitors first-hand information and status updates on the wide range of projects within the massive development. It also focused on the commercial plots on avail for investment, the B5 residential buildings plots, light industrial logistics and warehousing plots and the commercial showroom plots. Al Marjan Island (AMI), the first man-made island real estate project in Ras Al Khaimah, showcased a host of mixed developments (see Real Estate feature). Majid Al Futtaim Properties, a newcomer to the event, showcased its major community projects, displaying three amenity-rich neighbourhoods that can accommodate people’s modern lifestyles where they can live, work and play, and even learn in the same place. Cityscape Global 2015 witnessed a complete overhaul of the co-located conferences, The Facilities Management conference, jointly organised with Middle East Facilities Management Association (Mefma), and the Real Estate Brokers ran alongside the ‘Dubai Market Overview’ at the Conrad Hotel, Dubai. Cityscape Awards for Emerging Markets also ran in tandem with the exhibition.